It gently cleans the tooth surfaces, between the teeth, periodontal pockets and fissures with a lasting effect. It acts prophylactically – the antibacterial effect of ultrasound removes the plaque and tartar; inflammation cannot occur. It has a therapeutic effect, i.e. when a patient develops an inflammation such as periodontitis, aphthous ulcers, etc. within a few days the inflammation can be reduced or cured by breaking down bacteria which cause the infection. The effects of Emmi-dent oral hygiene with ultrasound are noticeable after the first application. Your teeth feel as though they have just been professionally cleaned. Children just hold the brush to their teeth. Brushing is not necessary. This makes it easier for parents and children. Cleaning with Emmi-dent is fun! The air vibrations of ultrasound also clean between the teeth. This is ideal for children. Flossing and rinsing, which are difficult for children, are now no longer needed or reduced. The Emmi-dent ultrasonic toothpaste is very mild. It provides billions of microscopic nano-bubbles that get into the tiniest spaces between your teeth. It develops billions of microscopically small nano-bubbles, which pervade even the smallest crevices between the teeth. The implosion of billions of microscopic bubbles destroy harmful deposits such as plaque and tartar. The antibacterial and therapeutic effect prevents cavities and makes visiting the dentist fun! 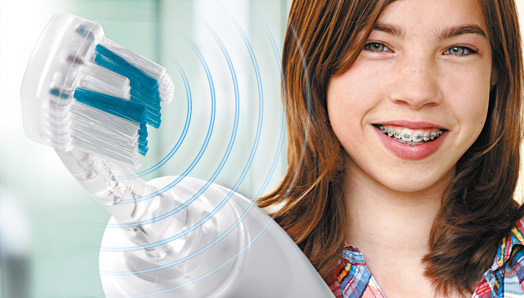 The special Emmi-dent brush for braces safely cleans braces and brackets with ultrasound. 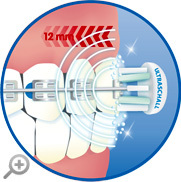 The special arrangement of the bristles together with our specially formulated toothpaste which creates billions of nano-bubbles, cleans away bacteria where it is especially dangerous: near the edges and even underneath the brackets to prevent the deposition of small food particles and sugar from drinks which creates a perfect environment for bacteria to live and grow. Normal toothbrushes cannot reach into these areas because the wire and the bracket make it almost impossible to brush there. The ultimate advantage of ultrasound is that it reaches everywhere. For teeth cleaning with ultrasonic kids don’t need to put pressure on the brush or to scrub for ages. Makes daily cleansing fun again, avoids endless hassles with children and dental hygiene. An ultrasonic toothbrush is an efficient way to reach bacteria located deep in your gum pockets. The alternative is a visit to the dentist who opens and cleans these gum pockets. Unfortunately, a small number of bacteria typically survive and the problem comes back regularly. When you regularly clean your teeth with Emmi-dent, the bacteria is constantly reduced and the problem is literally attacked at the source. Inflammations fade away or are drastically reduced – normally within a few weeks. Your gum should appear visibly healthier (see images below). 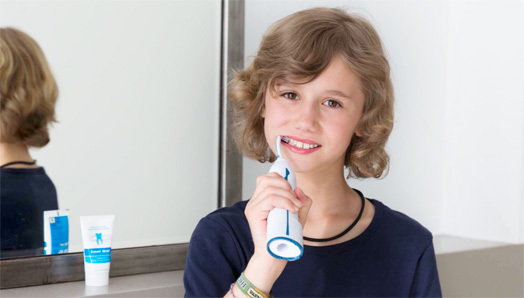 The Emmi-dent ultrasonic toothbrush eliminates bacteria and plaque which are the cause for inflammations. Tartar is being prevented effectively. The Emmi-dent ultrasonic toothbrush cleans parts that no bristles can reach and also deep inside the gum pockets. The Emmi-dent ultrasonic toothbrush activates the blood flow in the gums to support healing processes. The Emmi-dent nano-bubbles toothpaste supports or, more accurately, enables the cleansing process by creating millions of microscopic bubbles, which are able to reach into the smallest spaces between the teeth and deep into gum pockets. What is gingivitis and periodontitis? Gingivitis is an inflammation of the gum; periodontitis is a later stage which is associated with damage to the gum, jaw bone and tissues. If teeth are not cleaned properly, the buildup of plaque and calculus occurs. Plaque at the gum line causes the gums to become inflamed. A signal for it is gum bleeding while you are brushing. Gingivitis is the first phase which occurs. Bacteria reproduce and build pockets in the gum, upon which imflammation will occur within a couple of days. Periodontal pockets are an almost ideal breeding ground for bacteria and plaque to reproduce fast. The situation is getting worse and worse if nothing is done against the bacteria. If the inflammation is not effectively treated during the first phase (gingivitis), it may get worse and move on into the next phase called periodontitis. The gum pockets grow into the deeper part of the jaw and at depth the bacteria can attack the jaw bone and surrounding fiber system. The result: Teeth might become loose and fall out. Periodontitis is still the main cause for the loss of teeth for adults. Emmi-dent is the new protection against this widely-spread oral health issue. Naturally whiten your teeth, micro-bubbles remove stains in just a few days! You would like to have white teeth, but are afraid of bleaching with aggressive chemicals? Emmi-dent is a gentle way of bringing back the natural whiteness of your teeth. Discolorations from small colored particles (e.g. from coffee, tea, nicotine and wine) are not eliminated by regular brushing or normal toothpaste. However, our "nano-bubbles", which are up to 1,000 times smaller than regular toothpaste bubbles, offer exclusive benefits. These nano-bubbles are so small that they are able to eliminate the smallest particles in the crevices of the enamel. After just a few days, your teeth will be visibly whiter. The Emmi-dent toothbrush operates by creating millions of nano-bubbles (through our specially formulated nano-bubbles toothpaste) every millisecond, which then implode because of the ultrasound. This endless process cleans out particles in the microscopic cracks of your enamel. Your natural tooth color will return and remain for as long as you use Emmi-dent and our nano-bubble toothpaste. Whitening bleaching often weakens the surface of the tooth whereas Emmi-dent restores the natural whiteness of your teeth without bleaching. It is gentle and protects your enamel. Whitening toothpastes often contains a lot of silicate particles. These particles can scratch and damage your enamel when brushing your teeth with a normal toothbrush and special whitening toothpaste. Simply imagine polishing your car with sandpaper because that is what these whitening toothpastes are doing. The problem: The more grinding particles are included in a toothpaste the worse is the damage to your enamel. Experts measure the amount of particles by means of the RDA-value. The higher the value the more abrasive particles are in the toothpaste. The specially formulated Emmi-dent nano-bubble toothpaste requires no abrasive particles to clean because the ultrasound oscillations do all the cleaning –– and that without any motion, which is why we call it the "No-Brushing Toothbrush". Get rid of bad breath instantly. By eliminating the responsible bacteria your breath stays fresh for up to 12 hours. In most cases, bad breath, also known as halitosis, is caused by the bacterial decomposition of protein (protein substances) in the mouth or throat. The decomposition of proteins from food remains or dead cells in the tissue releases certain smelling side products (e.g. sulfurous gases). Involved bacteria are destroyed by the ultrasound, disabling the biochemical reactions which cause bad breath.. The ultrasound used for Emmi-dent cleans with up to 96 million oscillations per minute. Teeth’s cleaning with ultrasound does not only eliminate germs and bacteria in up to 12 mm depth, it also cleans away bacteria on the tongue. Emmi-dent destroys tartar and plaque. Emmi-dent cleans particles that can hardly be reached by regular bristles. Emmi-dent activates the blood flow in the gum to support healing processes. Ultrasonic cleansing with Emmi-dent protects your teeth and gum before and after a surgical treatment and reduces dangerous bacteria. Emmi-dent cleans with ultrasound (up to 96 million oscillations per minute). Ultrasound eliminated germs outside and up to 12 mm inside the tissue. Chlorhexidine mouthwash is often the only anti-bacterial means of cleaning that your dentist recommends after a surgical treatment because your gum is swollen and sensitive from the surgery. Even though the effect of chlorhexidine on bacteria and oral flora is controversial, side effects such as discoloration of the teeth do occur. Obviously, this is unwanted. In this case Emmi-dent is an almost ideal solution for a better oral hygiene: The motionless and thus gentler cleaning system eliminates bacteria on the gum and with that in the open wounds. Wounds cannot be damaged that way and the healing process is accelerated. Emmi-dent can safely be used if you have implants and after major oral and maxillofacial surgery. Our Emmi-dent effectively eliminates bacteria and plaque from crowns, bridges, and dentures. Ultrasound with up to 96 million oscillations per minute breaks down germs and bacteria outside and inside the gaps of artificial teeth and bridges. "Soft"-Ultrasound has only 0.2 watt in energy, enough to eliminate bacteria without doing any harm to prosthetics. No harm is done to crowns and bridges because Emmi-dent's ultrasound is "soft", it doesn't damage your restorations. Dentures offer a great environment for bacteria. This is why, despite the most thorough mouth hygiene, an unpleasant odor can be caused. Using Emmi-dent together with our specially formulated "nano-bubbles" toothpaste, will remove bacteria – the odor goes away instantly. Ultrasound effects bacteria inside the tissue near the implants and between the microgaps (the microscopic space between the abutment and the implant), which can cause bacterial infection. Your implants are protected because there is an increased bloodflow in the tissues. You invested into having a bright white smile with veneers, and now you want to keep your veneers shiny. Veneers are made out of porcelain, so they are sensitive to scratching from the small abrasive particles which are found in regular toothpaste. The more often you clean with normal toothpaste and a regular toothbrush, the quicker their shine will vanish. Emmi-dent is the only toothbrush that doesn't require brushing (the "no-brushing" toothbrush), you just hold the brush head gently to the surface of the veneers and they will be cleaned from bacteria and stains purely by ultrasound. Emmi-dent is supported by our specially formulated nano-bubbles toothpaste which does NOT contain any abrasive particles, ultrasound does all the cleasing. Our RDA-value is zero! Compare other toothpaste and their abrasiveness here: http://satyen.com/toothpastes.shtml. Keep in mind: The lower the RDA, the less damge to your enamel, zero is best!